Modulating compressors ... increased control, efficiency and comfort. 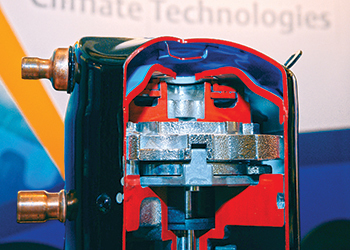 The Middle East can take a giant step towards energy efficiency by switching to air-conditioning systems with compressor modulation, which can reduce energy consumption by up to 40 per cent, Emerson Climate Technologies MEA told a recent summit held in Dubai, UAE. Addressing a thought-provoking discussion during the Smart Skyscrapers Summit held at Sofitel The Palm, Dubai in May (11 to 12), key officials of the leading provider of HVAC (heating, ventilation, air conditioning, and refrigeration) solutions highlighted the benefits of compressor modulation technology. The best-in-class compressor modulation technology is set to be a “breath of fresh air” in both the residential and commercial property industry, given the region’s rising demand for energy-saving innovations, said the company. Modulation technologies have the ability to modify compressor performance to meet the cooling demand and thus reduce energy consumption. Modulation technology leads to many benefits including increased humidity and temperature control, efficiency, reliability and comfort, it added. “What sets modulating compressors apart is their ability to adjust performance according to changes in the system load and ambient conditions. This enhances users’ comfort by facilitating a more even temperature and more precise humidity control. In addition, the variable capacity compressors have been proven to be more reliable, while offering greater flexibility in operating speed,” said Matthew Neidlinger, director – marketing MEA, Emerson Climate Technologies. “The UAE market is progressing towards compliance with new commercial air-conditioning energy efficiency standards, which the Emirates Authority for Standardisation and Metrology (ESMA) will introduce this year. This regulatory move will accelerate the shift towards smarter, more efficient air-conditioning systems, and we are looking forward to seeing similar moves in the GCC region,” Neidlinger added. Emerson Climate Technologies is the world’s leading provider of HVAC solutions for residential, industrial, and commercial applications. It combines technically superior products and services from its industry-leading divisions and brands with its global engineering, design, distribution, installation, and monitoring capabilities to create reliable, energy-efficient climate systems that improve human comfort, safeguard food, and protect the environment. The company’s Copeland Scroll compressors utilise modulation technology to offer efficient solutions for residential and commercial applications.